The Bitcoin price rally of the previous few days has experienced a slight blip on Thursday. 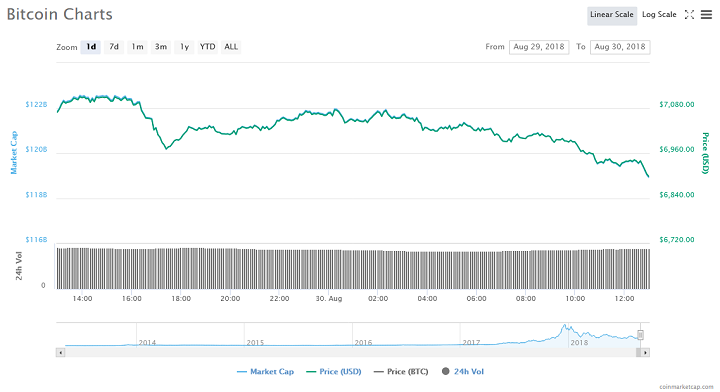 The prices of many cryptocurrencies also declined significantly, causing the total market capitalization to go down by almost $3 billion. When Bitcoin broke above $7,000, many experts identified $7,100 as a likely psychological barrier for the top-ranked cryptocurrency. Any significant bull run would mean BTC maintaining a price level above that mark due to the bearish nature of the Daily and Hourly Stochastic Relative Strength Index (RSI). The emerging consensus at the moment is that BTC could be in for another pullback that could see its price fall between $6,500 and $6,700. With the current mining price estimated at $6,000 the possibility of BTC price falling below that level is remote at best. Many analysts have long declared that a BTC price drop below mining cost is possible only under extreme price manipulation. As at press time, Bitcoin is down by almost 2.5 percent as it struggles to maintain $6,900. If that support level fails to hold then, BTC will most likely test the mid-$6,000 price region. 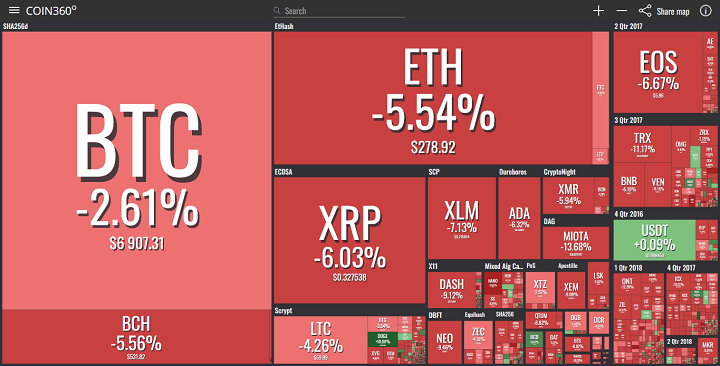 Bitcoin isn’t the only declining crypto in the market as most coins are in the red based on their 24-hour price movements. Ethereum, the second-ranked virtual currency is down by more than five percent to go below $280. IOTA is the biggest loser among the top ten coins, dipping by about 14 percent in the last 24 hours. Outside the top ten, TRX has been unable to continue its positive price run after the latest announcements from TRON CEO, Justin Sun. TRX is down by 11 percent over the last 24 hours. The most significant positive price movement in the top 100 is Dogecoin which is up by 21 percent. Thursday’s price slump comes firmly on the heels of the announcement by the EU that it would be considering issuing tighter cryptocurrency regulations. Bloomberg reports that finance ministers from EU member states are scheduled to meet in the first week of September to discuss the way forward as concerns virtual currency regulations in the region. Also, CME BTC futures contracts are set to expire on Friday. The period preceding past expirations has always seen an increase in BTC price volatility. However, BTC futures trading itself has no direct impact on the price of the asset since the trade is cash-settled – there is no movement of the underlying asset. Do you think Bitcoin will recover swiftly from the blip and resume its price rally? Let us know your thoughts in the comment section below.